Donegal Town is a busy shopping and tourist town in south Donegal where the River Eske flows into Donegal Bay. It was invaded by the Vikings in the 8th century and they used it as a port. This invasion is where the town got its Gaelic name, Dun na nGall, which means ’Fort of the Foreigners’. The Vikings built a garrison in the town, thought to have been in the grounds where O’Donnells Castle/Donegal Castle now stands. In recent years human remains were found in the grounds of Castle these are thought to be Viking. Donegal Town continued as a port until the 1960s when the last commercial boat left the harbour, sailing to Scotland with its load of electricity poles. Recently the Office of Public Works has renovated the castle. The keep has had new roofing and flooring added, in keeping with the original styles and techniques used in the 15th and 17th centuries. The stonework has been restored and the manor wing has been partially roofed. The oak timbers used came from the Brookeborough Estate in County Fermanagh. 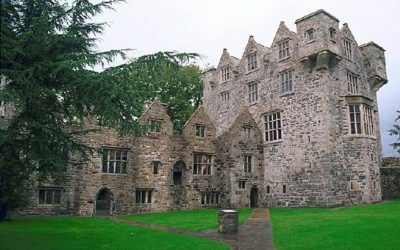 The castle is now open to the public and often hosts events such as Gaelic cultural evenings. In Donegal, hand-weaving is a skill that has been passed down for centuries through many generations. In the old days, many families lived by hand-spinning and hand-weaving cloth in their homes. The crofter’s wife made brews of moss and lichen into which to dip and dye the pure new wool from the household sheep. Her husband would then weave the unique family product into cloth to be sold at the tweed market. Molloy Sweaters Ltd is a family run business located in a region noted for its tradition in knitting, weaving, sheep farming, and fishing. The company was founded by pioneering hand weaver and craftsman, John Molloy. John Molloy (Ardara) Ltd manufactures a range of Men’s and Women’s knitwear for export across the world. Their range embraces both traditional Irish Aran fisherman’s sweaters and contemporary fashion knitwear. The John Molloy label offers a diverse range of fashion knitwear accessories, hats, caps, scarves, ponchos, capes, mittens and gloves. John Molloy’s Donegal Tweed range includes fabrics, jackets, caps, and ties.